Traveling with a large family to Disney comes with its own set of challenges. By Disney standards, a large family is a family with more than 5 people. So my family of 8 is downright gigantic. We have been going to Disney a couple times a year for the last 10 years and we have learned the tricks of traveling with a large pride. In this 4 part series I will tell you all our secrets for lodging, dining, tickets and enjoying the park. 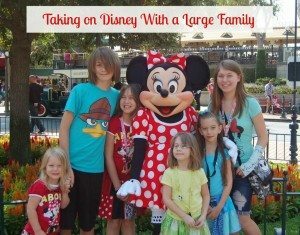 Big families can have an awesome time at Disney, all it takes is faith, trust and a little bit of pixie dust (sorry, I couldn’t resist!). Make reservations! Any Disneyworld restaurant can accommodate your large family, however, most will require advanced reservation. How advanced depends on the restaurant and the size of your party. The bigger the party, the more advanced notice you are going to have to give them. With our family of eight we have figured out that we can eat at all our favorite restaurants with about a month advance notice in the off season and about 3 months during peak times. Eat at off times – We have learned that if we don’t have a reservation, we will not be able to eat during peak meal time hours (11-2 and 5-7). If we ate a little earlier or packed snacks and ate later we are able to eat at any quick service restaurant without any trouble. Share meals – Dining in the park can get very expensive for a large family, but sharing meals can lessen the cost a bit, especially if you have younger ones. This isn’t an option at all restaurants, just because the portions aren’t that large, but at Cosmic Ray’s, 50’s Prime Time Café, Yak and Yeti, and Tangerine Café you can get large portions suitable for sharing at a reasonable price. Pack snacks! The easiest way to blow your meal budget is to snack at the park. Bring your own snacks in a backpack and save your money for your meals. Eat a big breakfast at the hotel! Some off-site hotels have a free breakfast option, if that is the case with your hotel, fill up there before you head to the park to save some money. Hydration – The cheapest option is to bring your own water bottles and fill up at the drinking fountains throughout the park. Unfortunately we all know that Disney water isn’t great, so we always end up buying bottled water. [Terri here jumping in to say a filtered water bottle takes the nasty taste away and keeps money in your pocket! Give it a try.] The best value for bottled water is in Tomorrowland near the Buzz Light Year’s Space ranger Spin. They have huge bottles of Dasani water for $3.50 compare that to the small bottle of water for $2.50 that you get everywhere else and it’s a pretty good deal. Let me give you a glimpse into a typical park day for us. We usually rent a condo now when we visit for a week or more (my favorite option now that my fam is so big!) so this is based on that. We have a big breakfast at the condo. We throw a bunch of snacks and bottled water (that I bought at Costco ahead of time) into a backpack and head to the park. We pay for lunch somewhere and a snack later in the day. We wait as long as we can for dinner, when we are all about to starve to death we head back to the condo and eat dinner there, usually I will throw something in a crock pot so we have a hot dinner waiting for us as soon as we get there. If I don’t we will throw together sandwiches or hot dogs. It works out perfect for us and allows us to save a TON of money. Stay tuned for part 3 on how to afford tickets for your large family! Previous PostEnter to WIN a Disney-Inspired Scented Candle from Walter & Rosie!!! Next PostEnter to WIN a One-Year Subscription to WDW Magazine! !